This case report illustrates root resection carried out before the completion of endodontic therapy and immediately during surgery, employed for eliminating the cause for external pressure resorption, to salvage the remaining portion of a strategically important tooth. A 31-year-old female patient reported with a complaint of pain and pus discharge in the upper right second molar region, that is, 17 since 1 week. Her medical history was noncontributory. Clinical examination revealed an intraoral swelling on the buccal aspect of 17 and 18, with a sinus opening [Figure 1]a. Clinically, 17 appeared intact, whereas 18 was partially impacted; 17 was tender on percussion and gave no response to thermal and electric pulp testing. Periodontal findings were within normal limits, except for an 8 mm periodontal pocket on the distal aspect of 17. Intraoral periapical radiograph showed resorption of distobuccal root of 17 due to impingement of mesioangularly impacted 18 [Figure 1]b. Sinus opening was traced using gutta-percha point, which pointed toward the root apex of 17. Following diagnosis of external pressure resorption of distobuccal root and pulpal necrosis in 17, root canal therapy was suggested. Access was opened followed by canal location and working length determination under rubber dam isolation. Root canal cleaning and shaping was carried out using K-files (Maillefer Dentsply, Baillaigues, Switzerland) and step back technique to conserve coronal radicular dentin. Canals were irrigated with 2.5% sodium hypochlorite and 0.2% chlorhexidine. Calcium hydroxide (Calcicur, Voco, Cuxhaven, Germany) was placed as an intracanal medicament. However, sinus opening showed no healing despite changing intracanal medicament over multiple visits and the patient was suggested to undergo extraction of 18. Extraction was carried out following flap elevation under local anesthesia. Inspection of the socket revealed the exposure of resorbed distobuccal root of 17 and the poor prognosis due to extensive bone loss around the root was evident [Figure 1]c. However, 17 was a strategically important tooth due to its distal most position in the arch. Therefore, decision to resect distobuccal root was taken to salvage the remaining portion of 17. Following extraction of 18, access to the root was readily available under the reflected flap. Hence, decision to immediately resect the root in the same surgical field was taken. Resection of distobuccal root was carried out using the vertical-cut method. Two vertical cuts were initiated in the furcation and along the crown using a long shank thin, tapering diamond point. First cut was initiated on the buccal aspect, whereas the second cut was made on the distal aspect of 17. Both the vertical cuts were carried through the furcation toward the center of the tooth and connected with each other to separate the distobuccal root [Figure 1]d. Following complete separation, the root along with a portion of the crown was removed out and radiographically verified [Figure 1]e and f. The resected distobuccal root showed extensive external resorption [Figure 1]g. The remaining furcation area of 17 was smoothened using diamond points. The flap was repositioned, sutured, and postoperative instructions were given to the patient. After 1 week, the sutures were removed. In the followup visit, sinus opening along with site of extraction and resection showed normal healing. Following this, remaining root canals of 17 were obturated with gutta percha (Dentsply Maillefer, Ballaigues, Switzerland), sealer (AH Plus, Dentsply Maillefer, Ballaigues, Switzerland) using lateral compaction technique. 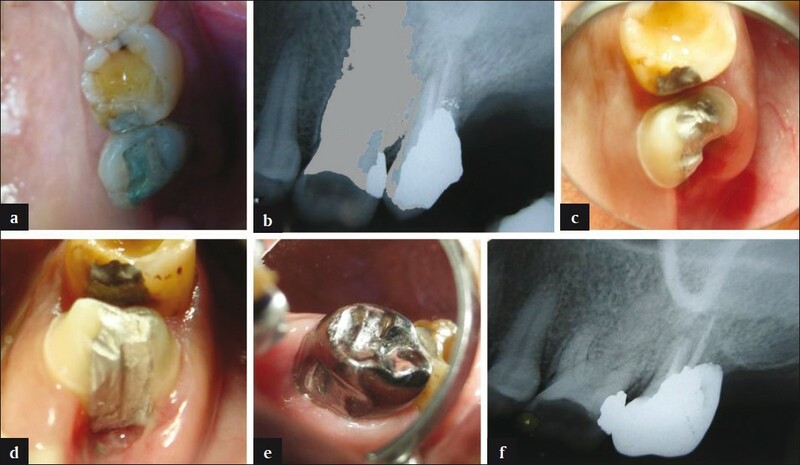 The access along with resected portion of the crown was restored with silver amalgam (Dispersalloy, Dentsply-Caulk, Milford, PA, USA) [Figure 2]a and b. In the subsequent visit, tooth preparation was done on 17 for full crown with a fluted design and knife edge finish line in the resected area [Figure 2]c and d. Full metal crown was fabricated with a concave contour at the resected area and cemented on 17 [Figure 2]e. At 1 year recall visit, resected 17 was found clinically asymptomatic with normal radiographic findings [Figure 2]f.
In the present case similar situation, but due to a nonperiodontal cause, occurred when poor prognosis of resorbed root was determined at the time of surgery and immediate resection was carried out. Extraction of 18 was carried out as the sinus opening showed no healing, probably due to severe bone loss between 17 and 18. Flap elevation and extraction of 18 confirmed the bone loss and poor prognosis associated with 17. However, extraction of 17 would have led to the occurrence of distal extension. Therefore, resection of strategically important 17 was found beneficial to remove its resorbed distobuccal root and to salvage its remaining portion to prevent distal extension with associated drawbacks. Resection was a suitable option due to the presence of nonfused roots with intact bone support around the remaining roots of 17. Since the endodontic prognosis without resection was unpredictable and due to the convenience of already available surgical access to the resorbed root, resection was carried out immediately in the same surgical field following extraction of 18. This prevented the need for another surgical entry and its associated trauma, in case the resection would have been carried out separately later. 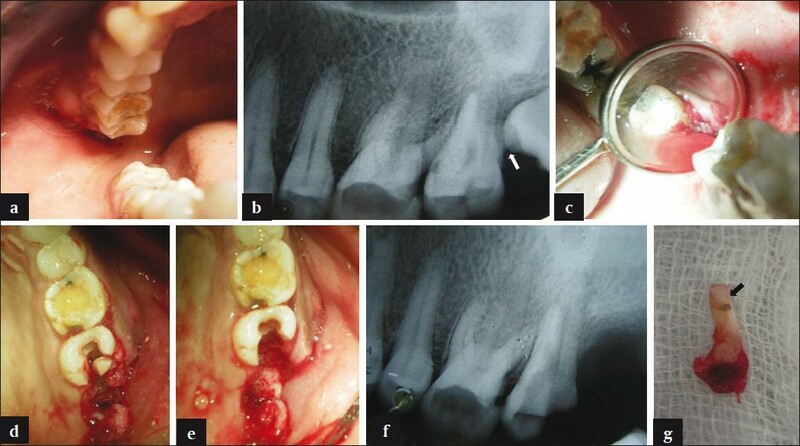 This case report highlights that to achieve favorable endodontic prognosis in a tooth showing pressure resorption, caused by impingement of an impacted tooth, may require the extraction of impacted tooth before the completion of endodontic therapy. In such a case, flap elevated for extraction may assist in ascertaining the prognosis of resorbing tooth. Furthermore, resection of resorbing root may be decided and carried out immediately in the same surgical field, like periodontal related resection, to prevent the need for a separate surgical entry later. In a similar situation, when the impacted tooth is a maxillary third molar, root resection in adjacent strategically important tooth may aid in salvaging the remaining portion of the tooth to avoid distal extension. 1. Weine FS. Endodontic Therapy, 6 ed. St Louis: Mosby; 2004. p. 1-23, 423-51. 2. DeSanctis M, Murphy K. The role of resective periodontal surgery in the treatment of furcation defects. Periodontol 2000 2000;22:154-68. 3. Hempton T, Leone C. A review of root respective therapy as a treatment option for maxillary molars. J Am Dent Assoc 1997;128:449-55. 4. Raja VS, Emmadi P, Namasivayam A, Thyegarajan R, Rajaraman V. The periodontal - endodontic continuum: A review. J Conserv Dent 2008;11:54-62. 5. Benenati FW. Root resorption: Types and treatment. Gen Dent 1997;45:42-5. 6. Minsk L, Polson AM. The role of root resection in the age of dental implants. Compend Contin Educ Dent 2006;27:384-8. 7. Majzoub Z, Kon S. Tooth morphology following root resection procedures in maxillary first molars. J Periodontol 1992;63:290-6. 8. Stewart KL, Rudd KD, Kuebker WA. Clinical Removable Partial Prosthodontics. 2nd ed. St. Louis, Tokyo: Ishiyaku EuroAmerica, Inc. Publishers; 2003. 9. Van Swol RL, Whitsett BD. Root amputation as a predictable procedure. Oral Surg Oral Med Oral Pathol 1977;43:452-9. 10. Smukler H, Tagger M. Vital root amputation- a clinical and histological study. J Periodontol 1976;47:324-30. 11. Schmitt S, Brown FH. Management of root-amputated maxillary molar teeth: Periodontal and prosthetic considerations. J Prosthet Dent 1989;61:648-52. 12. Park SY, Shin SY, Kye SB. Factors influencing the outcome of root-resection therapy in molars: A 10 year retrospective study. J Periodontol 2009;80:32-40. 13. Newell DH. The role of the prosthodontist in restoring root-resected molars; a study of 70 molar root resections. J Prosthet Dent 1991;65:7- 15. 14. Guzy GE, Nichols JI. Invitro comparison of intact endodontically treated teeth with and without endo-post reinforcement. J Prosthet Dent 1979;42:39-42. 15. Green E. Hemisection and root amputation. J Am Dent Assoc 1986;112:511-8. 16. Kost WJ, Stakiw JE. Root amputation and hemisection. J Can Dent Assoc 1991;57:42-5. 17. Phillips RW, Isler SL. Dental amalgam: An update. Compend Contin Educ Dent 1983;44:397-402. 18. Appleton IE. Restoration of root-resected teeth. J Prosthet Dent 1980;44:150-3. 19. Sorensen JA, Martinoff JT. Intracoronal reinforcement and coronal coverage: A study of endodontically treated teeth. J Prosthet Dent 1984;51:780-4. Verma, P.K. and Srivastava, R. and Baranwal, H.C. and Gautam, A.